trixie delicious: The $10 wall- no really! In my new space I have bars on the windows which don't open AND we've had the hottest summer day in Auckland since 1868.This doesn't matter because the noisy old air conditioning units keep my paint from drying on my brush and me cool enough to do my thing. 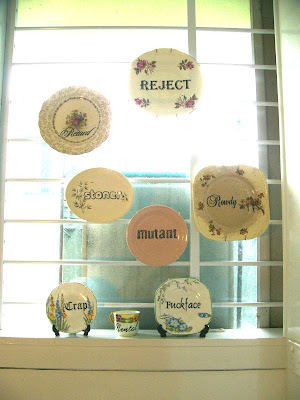 i love that the reject plate..is a reject. makes me smile.